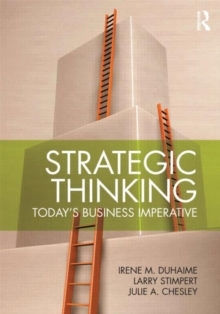 There are many strategy books available in the marketplace for today's student or business professional; most of them view strategy from the 10,000 foot level, while Strategic Thinking looks at this important business topic through a different lens. Written from the perspective of a manager, this book builds on theories of managerial and organizational cognition that have had a powerful influence on many business fields over the last two decades. 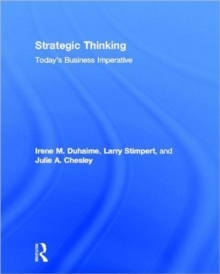 As other books on business policy and strategy cover a broad range of topics, models, frameworks, and theories, the unique feature of this book is that it covers all this, but also focuses on how managers of business firms understand their business environments, assess and marshal their firms' resources, and strive for advantage in the competitive marketplace. It examines the economic, structural, and managerial explanations for firm performance. Offering professors and business people who are intrigued by the ideas introduced in Peter Senge's books ways to apply those ideas and principles in the classroom and in the companies in which they work, the book puts managers front and center.